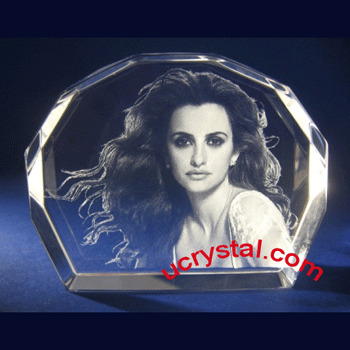 Personalized engraved crystal awards and 3D laser crystal awards are excellent for use as corporate executive and employee recognition awards and plaques. It is a wonderful way to recognize your executives and key employees, appreciate loyal customers, and appreciate reliable suppliers. 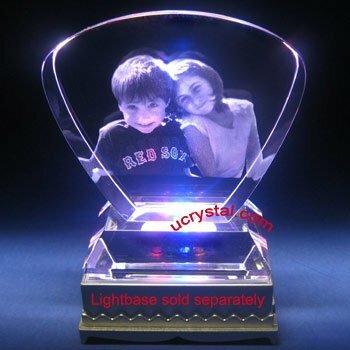 We can engrave your logo, photo, and text inside the 3D crystals. We can design the layouts for you or do as you wish. Awarding your employees or recognizing your executives with a personalized crystal award is a wonderful way to show your appreciation. Each time your employees or clients see a unique crystal award, they will know their dedication and exceptional effort is valued. 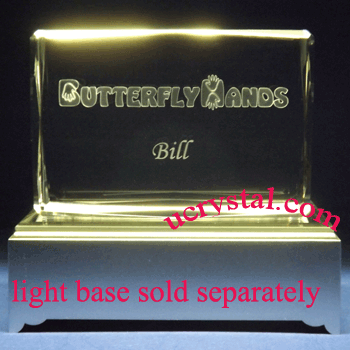 Our customers demand high quality engraved crystal awards at low prices, which is exactly what we do for you. 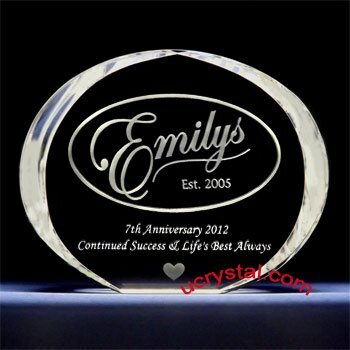 Ucrystal.com has many selections of custom engraved crystal awards to choose from. Each one comes with free engraving, free layout, and no text limits. From high quality well-polished custom engraved crystal awards to 3D laser engraved crystal award, to custom engraved extra-large executive crystal plaques. your brand has a unique chance to show characteristics. Unlike other award shops, we use advance laser engraving technology to engrave you photo, logo and text inside the crystal while keep the surface smooth and undamaged. 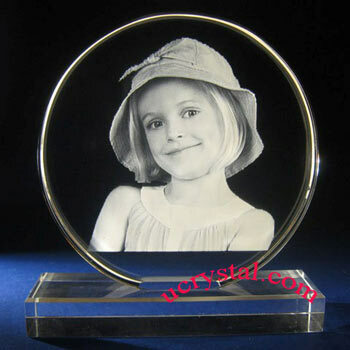 We even can convert your employee photo or your company logo into 3D and laser etched them inside the crystal. Our highly skilled and dedicated team is ready to work with you any time for your project. With so many high-quality crystal selections, let us help you find the crystal awards engraved to fit your organization and corporate office needs. The crystal award options have no limit, and the designs are endless, all customized to your taste. They can be used alone by themselves or combined with LED light bases (or light stands). Since light bases are not part of the crystals, they need to be purchased separately. The extra large crystal awards are especially designed to recognize the top executives who made your company successful. They have elegant design with extra-large sizes to let your company show your appreciation. Our executive crystal award collection has different shapes and styles. Personalized message, company logo and the photo of the executive can all be designed to make the award personal and exclusive. No matter what your need is, ucrystal.com has the perfect awards for the deserving executive. 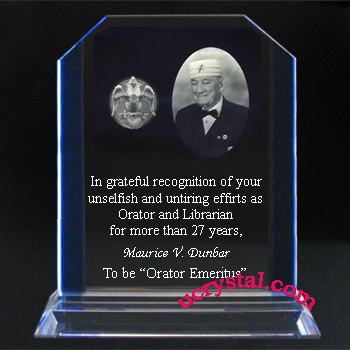 Please look at ourEXTRA LARGE CUSTOM ENGRAVED CRYSTAL AWARDS collection and let us know which one is right for you. We can help you with the drafting and design of the crystal award. 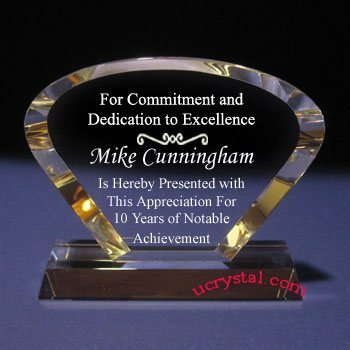 When you want an elegant, high-quality award that is all your own, ucrystal.com allows your organization to create a unique sign of appreciation. 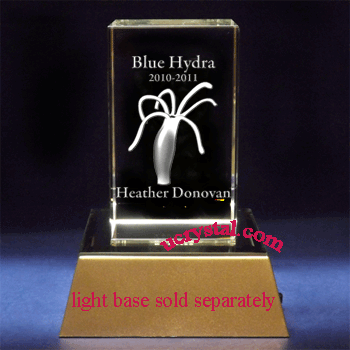 At ucrystal.com, you can customize your crystal award any way you want. Choose a shape that reflects your ideas, our design team will work with you to understand your vision and then make it a reality. You will get to see a proof of your award before it’s put in production. Make your crystal award a dazzling piece of art. 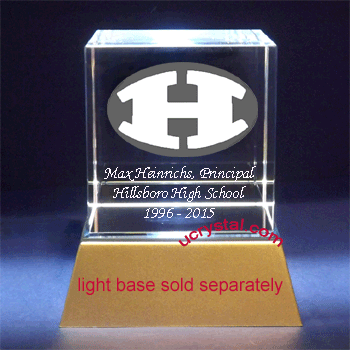 Personalized laser crystal etching is an excellent way for fabricating engraved crystal awards for patents awarded, custom etched crystal awards for projects accomplished, and corporate crystal keepsakes for grand opening giveaways. Other occasions include annual employee recognition, employee retirement, and guest lectures. Through our diligence and quality workmanship, we have proudly served many top-tier US companies and organizationsand hope to add your organization to the long list of satisfied corporate customers. We have the finest engraved corporate awards and employee achievement awards. We believe that companies that recognize their employees tend to have better employee retention, and their employees feel valued and appreciated. They enjoy their work and are more productive. 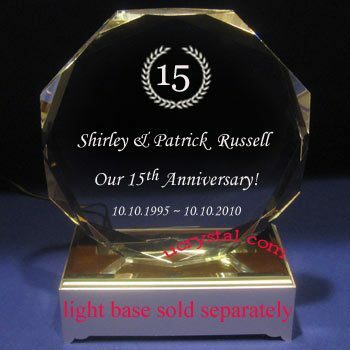 Nothing is better at preserving their fond memory and their career achievements than a finely crafted crystal award personalized to their taste and highlighted by a beautiful light base. 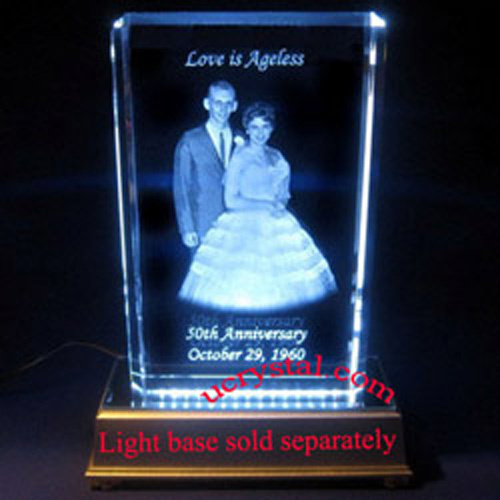 Please look at our CUSTOM ENGRAVED CRYSTAL AWARDS collection and let us help you make it happen. Awarding your employees or recognizing your executives with custom 3D laser engraved crystal awards is a wonderful way to show your appreciation for their accomplishments and dedication. We can convert your company logo and employee photos from 2D to 3D and engrave them inside the 3D crystals without damaging the surface. 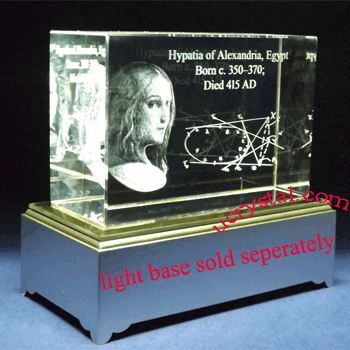 The 3D crystals are generally thicker than 2D laser crystals, so they can accommodate the depth requirement of 3D laser crystal award engraving. 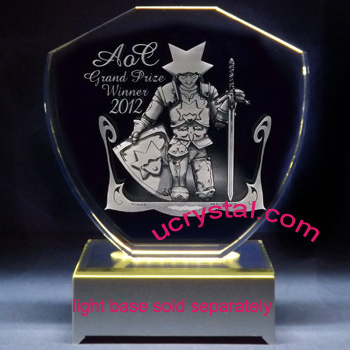 On the other hand, thicker crystals can be used for 2D crystal award engraving as well. 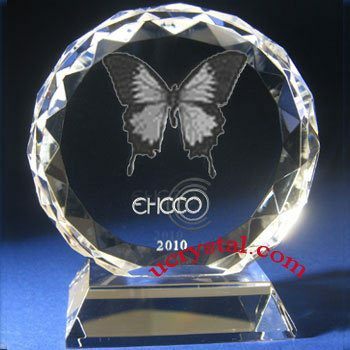 We are a premier supplier of 3D laser engraved crystal awards and custom engraved 3D crystal awards. 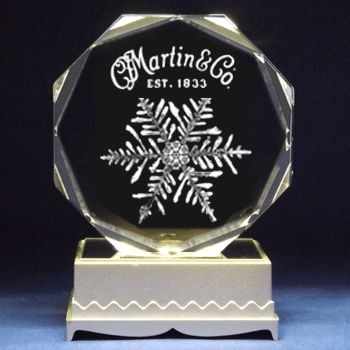 3D laser engraved crystal awards have been shown to be highly regarded as recognition awards, executive achievement and corporate crystal gifts. Many corporate customers also use them as employee retirement souvenirs. The engraved images appear to be FLOATING inside the crystal. 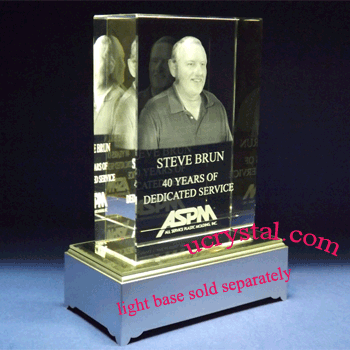 Those personalized high-quality 3D LASER CRYSTAL AWARDS and corporate crystal gifts always amaze our customers and make the recipients wonder how this could possibly be done. 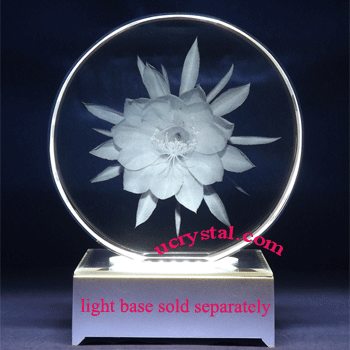 No matter what type of crystal award has caught your eyes, you can always trust ucrystal.com to be the best place to shop for high-quality crystal awards. Receive a free layout with every order and talk to our team whenever you want so you can be confident in your selection or design. Your complete satisfaction is guaranteed, and we're always here to help. Find crystal awards you love and the recipients love. 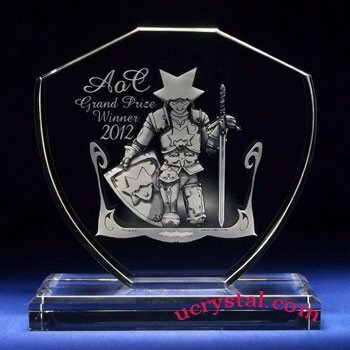 ucrystal is the leading supplier of 3D laser engraved crystal awards and plaques to the corporate recognition crystal products. 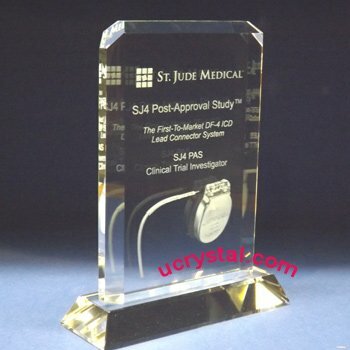 Our custom engraved crystal awards and engraved crystal plaques are grouped in the following theme collections: executive crystal plaques and awards, regular size crystal awards and plaques, 3D crystal wards, extra large custom engraved crystal awards and plaques, personalized corporate crystal gifts - paperweights. 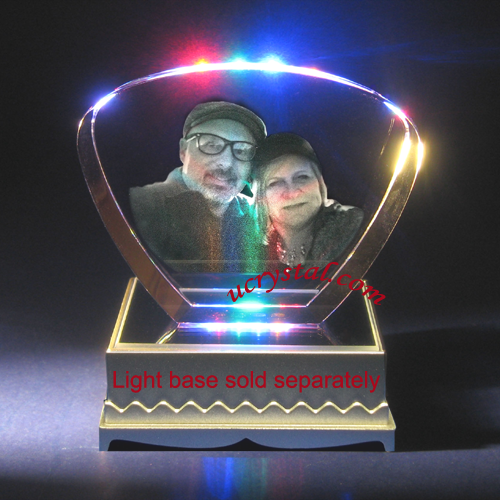 To display and enhance your 2D or 3D crystal awards, we have light bases for crystal plaques and awards available for each of our 2D or 3D crystal awards to make our custom engraved crystal awards and plaques unique and stand out. 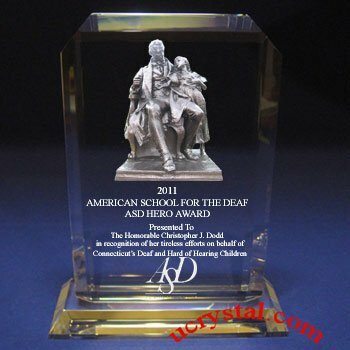 Ucrystal provides full service in house in USA, from graphic layout design to 2D or 3D crystal awards engraving. 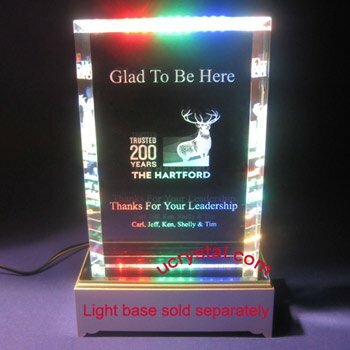 Laser engraved crystal plaques and awards are great for use as corporate engraved crystal awards and crystal plaques to recognize your key employees and appreciate loyal customers. 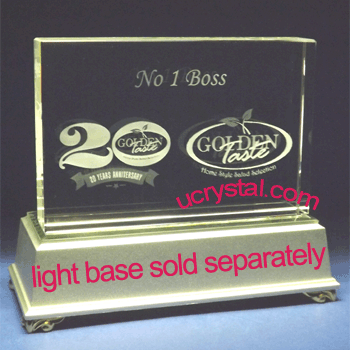 For example, our custom laser crystal etching has been used as corporate crystal plaques for executive awards, top sales performance awards, patents awarded, engraved crystal awards for projects accomplished, and crystal souvenirs as grand opening giveaways. 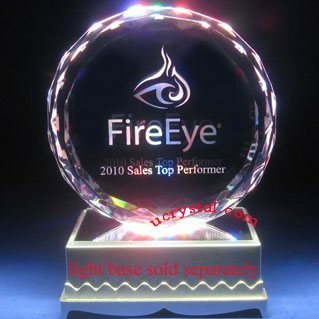 All of our custom engraved crystal awards can be customized and personalized with logo and text engraving. For 2D custom engraved crystal awards, we will laser engrave the logos and employee photos INSIDE the crystal without damaging the surface. 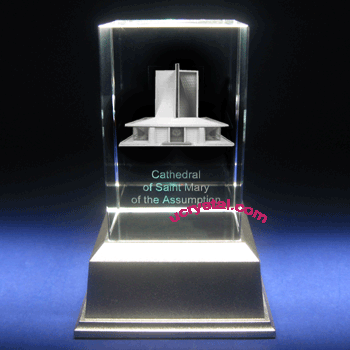 For 3D crystal awards, we can convert your corporate logos, photos into 3D via a manual process with a small charge. As a commitment to our customers, we offer FREE layout design, Free engraving, and No text limit on all of our crystal awards and plaques. We strive to serve our customers by providing high-quality, personalized services for your crystal plaques and crystal awards engraving needs. Your satisfaction is our top priority. Your word-of-mouth and referrals are the best way for us to grow our business. 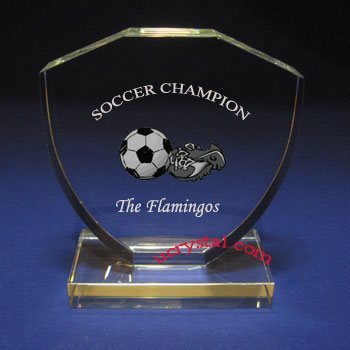 We have proudly served many top US companies and organizations with custom 3d laser awards, custom engraved crystal awards and engraved crystal plaques. We would like to have the privilege of adding your organization to the list of satisfying customers.